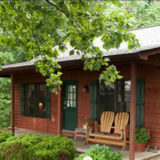 Three secluded romantic cabins on 51 acres with great views. King bed, fireplace, double Jacuzzi, hot tub on deck, satellite HDTV. Sleeps 2 per cottage. $235-$265. Pets Welcome, WiFi, Smoke-Free Property.